This product is a very convenient portable scale, it can be used to weigh and price the items at any time by connecting your mobile phone. It is convenient and easy to use, it&apos;s your best choice for your daily life. 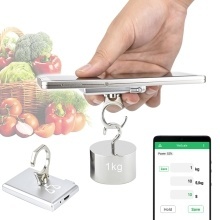 Can be used to weigh and price the items at any time by connecting your mobile phone. Can be used as a kitchen scale after hanging the weihing pan. It is a versatile and very practical portable scale, it is a great helper in your daily life. Be careful not to weigh overload items, easy to damage hooks.